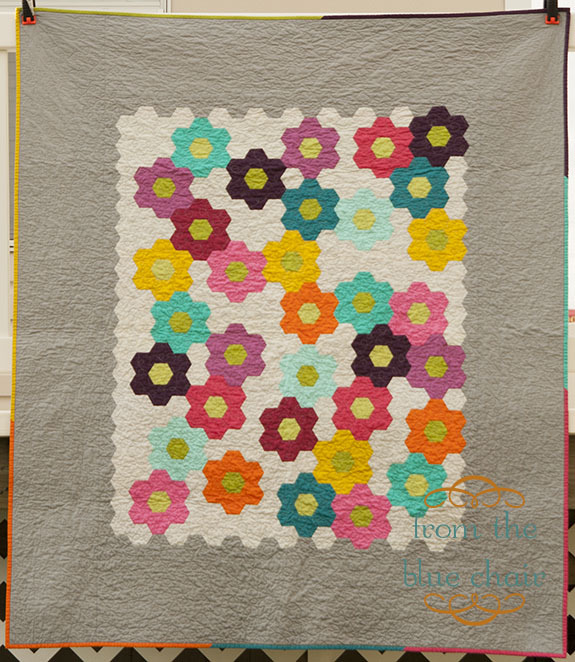 I love the look of the Grandmother’s Flower Garden pattern, but I dislike hand sewing hexagons. 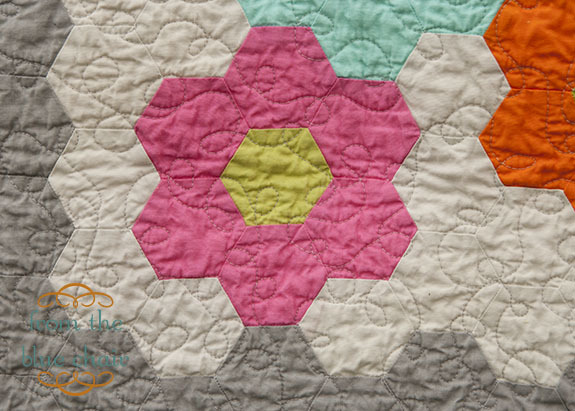 Since I was teaching at Sewing Summit on Y-seams and sewing hexagons, I challenged myself to machine-piece a Grandmother’s Flower Garden project. These hexagons are 3” cut point-to-point or a 1.5” side. The whole panel was machine pieced. I admit I planned it to be larger, but ran out of steam. If I wasn't under a self-imposed deadline to finish it to share at Sewing Summit, I would have put it aside for a while. I originally planned this to just be a small child-size quilt, but I loved this too much and wanted it usable for me as well, hence the large borders to make it larger. 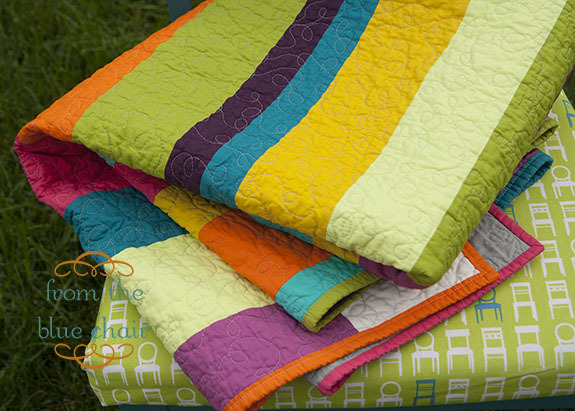 The whole quilt is made from Art Gallery Pure Elements. It finished about 55” x 65”. The back is one of my favorite quilt backs. I simply took various cuts of Pure Elements that were WOF and sewed them together. I sewed the white fabric on the sides to add width. I originally tried to get creative with the quilting on this one, but my machine wasn’t happy with the pattern I was trying. I ended up doing an all-over loopy pattern. I wanted to quilt it heavily to tack all these seams. It washed up quite nicely and is a new favorite small throw. It came out gorgeous Kati! I have a thing for Grandmother's Flower Garden I think because I love my Grandma so much and they have a lovely garden of roses and all kinds of flowers at their house. Beautiful! The big gray border is brilliant, in my opinion:) I love it! Just love this! I love the border, really makes the center the focal point! This is really pretty. I appreciate your border of hexagons in the background color. I think it ties together the flowers and the background very nicely. What a pretty quilt! I love it when the back is just as pretty as the front. Makes it feel like a bonus quilt. I don't have the first clue about sewing Y seams. Too bad I couldn't go to SS! Its Beautiful! Does the machine piecing go that much faster? 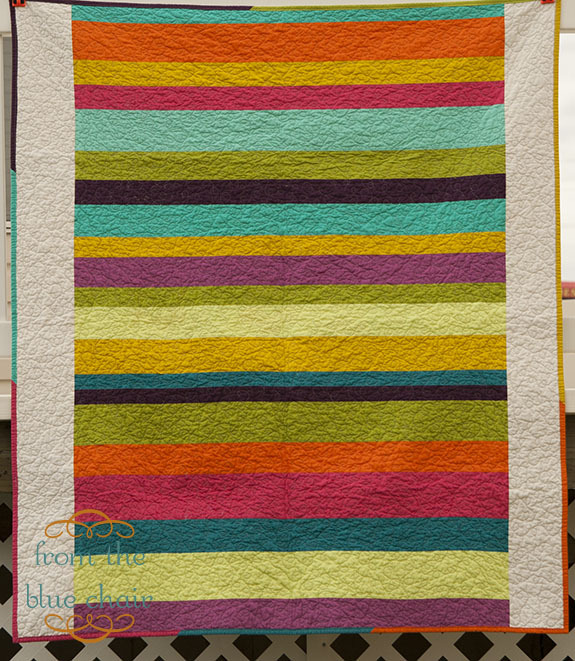 Fabulous quilt - a technique I am putting on my must do list. The art gallery fabric is so yummy. It was so great to meet you in person at Sewing Summit, I had an amazing time. 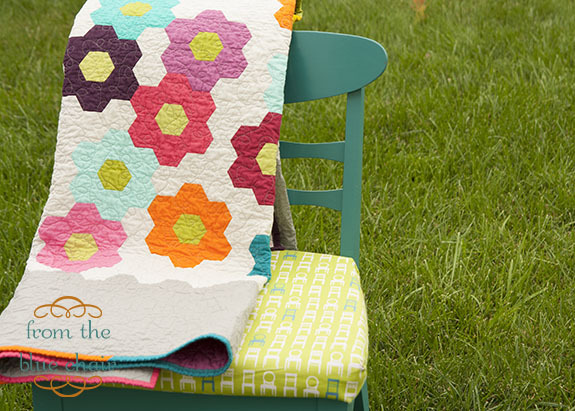 That is so pretty and the back is fabulous - more like a quilt with two fronts! Thanks for sharing! Oh! It is so lovely! I am doing a grandmothers flower garden by hand, but will probably machine quilt it :). Love those loops!! Wow! I want one of my own! Love your back as much as the front. How about a tut...pleeeeze! It's gorgeous, front AND back! Lovely. I love how you arranged the flowers randomly, with paths between some and touching for others. Very beautiful. Love the back too. It looks stunning - Are the hexies Go cut? Amazing you sewed these on your machine! The back is really great, too. This is beautiful!! It just makes me all the more sad I couldn't come to your class. 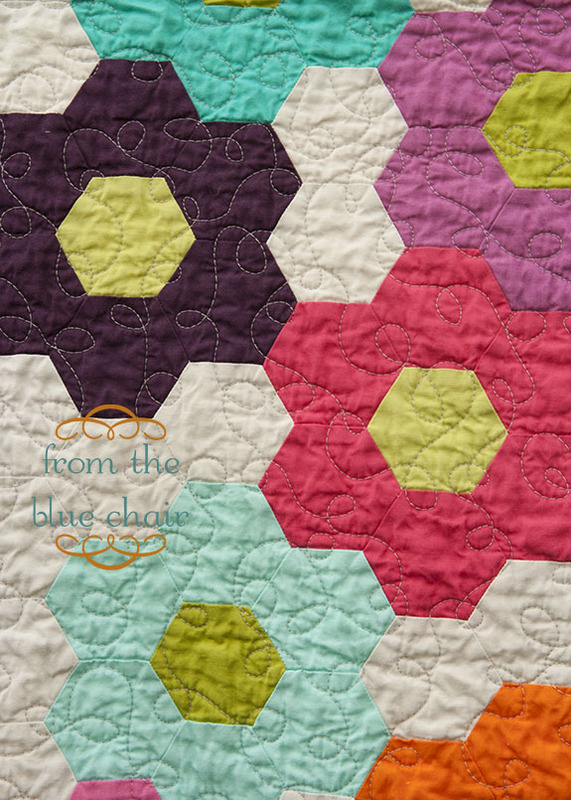 I am going to have to try piecing hexagons with my machine, it just looks awesome!! Gorgeous quilt... love the back, too! Gorgeous quilt, loved seeing it in person and taking your class. Great to meet you finally. Love you blog, your quilts, your voice. OMG! I can't decide which I like best - the front or the back! Kati, this quilt is awesome! All those colors compliment each other so well, and I can't believe all the y-seams! I think it's definitely a project to add to your blog header. What a gorgeous quilt! I love all the solid colors together. This looks amazing in the solids - beautiful colours! I really have virtually no idea what I am doing with quilting. I have always wanted to learn and am trying to teach myself. I think I am understanding the basic concepts, but I don't want to screw up the projects I am beginning. I was wondering if there were some pointers I need to know in the beginning. I am making a denim quilt first and then moving to a granmas flower garden quilt. Both of these projects are being made for people that matter a lot to me. I am particularly worried about the latter quilt because it is meant as a gift to a dear friend who lost their quilt that their own grandmother had made them in their teenager years due to some personal struggles. it would mean the world to her to have another one and i want to pull this off. any tips or suggestions would be greatly appreciated. thanks so much.